Shutting down a refinery for maintenance is not something you want to hear as a petroleum transportation company. Powering down and restarting operations in addition to revenue loss during shutdown adds up amazingly fast. 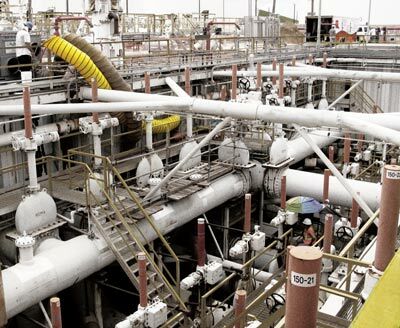 Large refineries that contain dizzying mazes of never ending pipes and valves have to maintain precise balance and structural stability to continue their large, delicate fuel transportation operation. 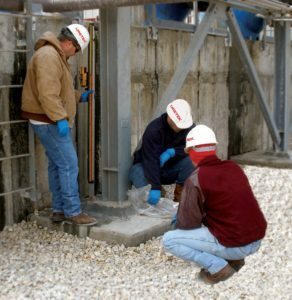 Finding unique and innovative structural maintenance solutions that can be completed with minimal shutdown along with prioritizing safety as equally, if not more important than shutdown is a difficult task. This challenge became a reality to one of North America’s largest pipeline transportation after engineers found unstable, soupy soil conditions behind and beneath their facility. Kinder Morgan is one of the largest pipeline transportation and energy storage companies in North America with more than 37,000 miles of pipelines and 170 terminals. Its Pasadena, Texas, terminal is a 174-acre site with 128 above-ground storage tanks ranging in size from 5,000 to 300,000 bbls. Petroleum products, including gasoline and diesel, are received from regional refiners and producers, stored, and then transferred to awaiting users via pipelines, ships, barges, and/or trucks. 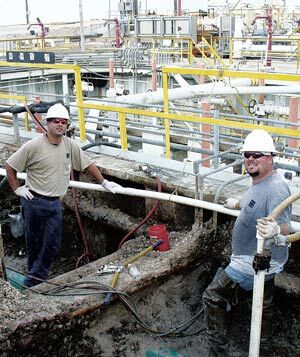 Deep in the interior of this massive Houston Ship Channel facility are below-grade manifold pits where 36-inch diameter steel pipes are routed through a series of giant valves to transfer pumps, which, in turn, push fuel products into pipelines feeding various regions of the United States. These 25-feet deep pits, constructed of driven sheet pile, contain a maze of piping, valves, and pumps. After years of service, severe corrosion had damaged some of the larger-diameter steel lines where they penetrated the sheet pile. Any leaks could create explosive and devastating situations. To effect the repair, a large square panel was to be cut from the sheet pile to provide access to the corroded area for cleaning, repairing, and recoating. Soil tests, however, revealed that the soils behind the sheet pile were highly saturated and weak. If the sheet pile was cut, an avalanche of soupy mud and soil would flood into the pit risking a collapse of the entire structure. To prevent a collapse, the soils behind the wall had to be stabilized, strengthened, and the free water driven out so that the soil wall would stand unsupported. URETEK ICR Gulf Coast was called in to inject patented URETEK 486 polymer at depth into the soil to strengthen and stabilize it. This moisture resistive structural grade polymer is unaffected by the free water and saturated condition of the soil, expanding up to 15 times its volume in a matter of seconds, void filling, stabilizing, and strengthening the soil while pushing away and squeezing out hundreds of gallons of free water from the soil. Injections were made through tubes deep into the soil both horizontally through the sheet pile walls and also vertically from grade. Once the soil was stabilized, the sheet pile could be removed and the corrosion repair performed without fear of collapse. The element resistive nature of the URETEK material, the expansive force that the material can generate, and the rapid cure time enabled this repair to be accomplished successfully along with the massive re-piping and excavation exercise. 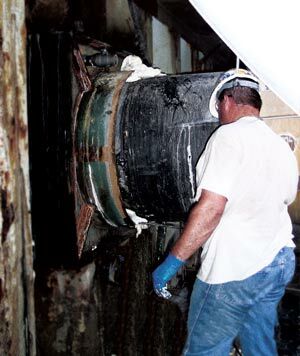 URETEK ICR Gulf Coast was on 24-hour standby as the openings for two separate pipe repairs were cut. Both repairs were completed with only minor additional injections needed to control ground water. The supply of gasoline and diesel to the eastern seaboard continued uninterrupted because of the unique and sophisticated characteristics of URETEK material and technology.